ONI Bureau: The plenary session of largest investment summits in India, ‘Make in Odisha Conclave 2018’ started at the Janata Maidan in Bhubaneswar today. The session was attended by Japanese Ambassador to India Kenji Hiramatsu, Mukesh Ambani, Chairman & Managing Director, Reliance Industries Limited (RIL); Kumar Mangalam Birla Chairman, Aditya Birla Group; Anil Agarwal, Chairman of Vedanta Resources Plc; Natarajan Chandrasekaran, Chairman, Tata Sons; Mr. William P. Davis, Exxon Mobile; Mr. T.K Chand, Chairman, National Aluminium Company Limited (NALCO); Satish Pai, CEO, Hindalco, Ritesh Agarwal, CEO,OYO Rooms; Anil Kumar, Steel Authority of India Limited (SAIL); Sajjan Jindal, MD, JSW Group; Rajnish Kumar,Chairman, State Bank of India (SBI), Sanjiv Puri, MD, ITC; Naveen Jindal, Chairman, Jindal Steel; Ananta Das, Hon’ble Minister for Industries, Government of Odisha; Aditya Prasad, Chief Secretary, Government of Odisha; Mr. Sanjeev Chopra, Principal Secretary, Industries Department, Government of Odisha among other senior Government officials and delegates from several countries. Addressing the conclave Chief Minister Naveen Patnaik said that the State Govt have laid down the Odisha Industrial Development Plan: Vision 2025 with a target of attracting investment of INR 2 Lakh 50 Thousand Crore and creation of 30 Lakh job opportunities in 6 identified focus sectors by 2025. The State Govt also built an excellent infrastructure an 18-storeyed World Skill Centre in Bhubaneswar, that will function as the centralized hub with all 71 Government ITIs as spokes for implementation of the Odisha Skill Development Project – an ambitious INR 1400 Crore project. At the Make In Odisha Conclave, Reliance Group CMD Mukesh Ambani , Tata Sons chairman N Chandrasekaran, Aditya Birla Group Chairman Kumar Mangalam Birla and other industrialists promised huge investments in Odisha in future. 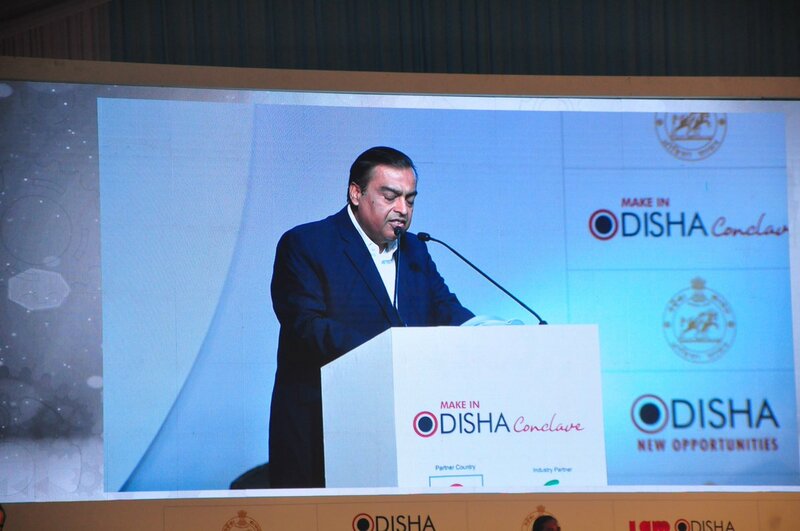 Giving more emphasis on the digital revolution, Ambani said Reliance has already invested Rs 6,000 crore in Odisha to become one of the largest investors in the state.Jio has helped connect 43,000 villages in Odisha to the domestic and global network. For most of these villages, Jio has provided not only their first phone, but first TV, first Camera, and first internet and brought AI in their lives, at an affordable pricing of INR 100 per month. Reliance Group CMD Mukesh Ambani announced an investment of more 3000 crores in Odisha; announced Reliance Foundation-Odisha High Performance Athletics Centre that will train local talent to develop them to Olympic medal winners. JSPL have plan to increase production capacity of Angul plant to 20 million tonnes by 2030: Chairman Naveen Jindal. A modern Greenfield Steel Plant will be set up in Odisha, said JSW Group Chairperson Sajjan Jindal. Tata Sons will invest Rs 25,000 crore in the State, said chairman N Chandrasekaran. Earlier it have made investments worth Rs 75,000 cr with the announcement of Kalinganagar expansion. Aditya Birla Group Chairman Kumar Mangalam Birla announces investments of US$2-billion (14,400-crore). Chief Minister Naveen Patnaik addresses at the Make in Odisha 2018. MD of ITC Ltd, Sanjiv Puri says Welcome brand Hotel in Bhubaneswar will be operational from end of next year. An MoU was signed between Singapore’s ITEES and Odisha’s OSDA for Skill development to cooperate and establish a World Skill Centre at Bhubaneswar.